This chalet in Bad Kleinkirchheim is a unique designer log house available for rent in Austria. Stylish design and excellent facilities make it an exclusive choice of ski accommodation. 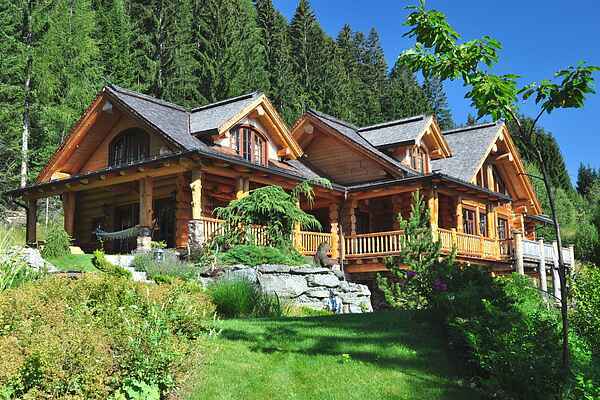 This is probably the most luxurious chalet in the Austrian Alps! The chalet is an exclusive ski rental property with an outstanding location on the hillside overlooking the town of Bad Kleinkirchheim and positioned on the ski slope. Recently constructed, this large modern chalet has been designed with superb taste to create an extremely stylish holiday property. The chalet is flooded with light and offers uninterrupted vistas over the sunlit Bad Kleinkirchheim valley from the bright and airy living spaces. In the villa’s 6 bedrooms, up to 14 guests can enjoy a superlative standard of accommodation spread over 700 square meters of living space. An elegant color scheme and stylish rooms mean guests can retire to a calm and peaceful space when they would like some privacy. Some of the excellent facilities at this large luxury chalet include a fitness area, a wellness area with two saunas and Jacuzzi, Tanning bed, and Vine cellar. In short, everything you need to enjoy a thoroughly relaxing holiday in deluxe style.